Coastal Forest Merlins appear uncommon to rare, but their true status is still regionally undetermined. 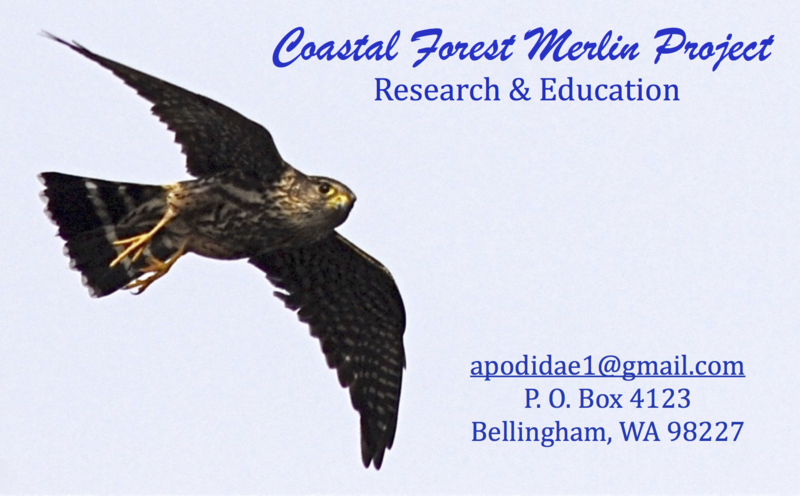 Fieldwork since 1983 in Washington provides the empirical evidence that Coastal Forest Merlins are less common than Bald Eagles, Peregrine Falcons, Spotted Owls, and Marbled Murrelets-all threatened or endangered species. The Coastal Forest Merlin’s historical distribution was presumed to be from southern Puget Sound in Washington to northern British Columbia west of the Cascade and Coast mountain ranges. Current distribution may be similar but is still being refined and will take a considerable effort to confirm. Appropriate habitat for the annual life cycle is also constantly fluctuating, probably in response to human-modified landscapes. Integrating Northwest people’s lifestyles with those wildlife communities with whom we share the land is an achievable goal. We believe that knowledge about salmon, eagles, amphibians, bats, Merlins and other wildlife helps us all to understand and maintain the diversity we all need in our lives.